Stream the Friends Life-est podcast ever by clicking here! Or subscribe for free in the iTunes store and/or subscribe for free via our RSS feed. For ALL the must-see videos of the Friends Life Women’s Tour check out Sarahs comprehensive post over at Podium Cafe (seriously there’s literally hours of video there). And for the collection of Sarah’s audio interviews while she was on tour, check out this great post. There is so much coverage of the first ever Friends Life Women’s Tour (of Britain!) so I’ve made a post over on Podium Café, with the daily videos, audio and video and written interviews, and other stuff I’ve liked. There’s tons and tons of it, and people will add things they’ve seen to the comments. Check it out – and if you want to see the 5 hour-long programmes from ITV4, they’ll be up on their ITV Player for another month – head here, and if they’re geo-restricted for you, try them with Hola or Tunnelbear set to the UK. This was possibly my favourite moment, though – the riders and incredible crowds singing and dancing on the Bury St Edmunds final day. I loved this Tour, I wish it could last forever! On Saturday 8th June 2013, it’ll be be the IG Nocturne – a whole series of races in the Smithfield area of London, including urban cyclcocross, penny farthing and folding bike races – and elite criteriums for men and women. These elite crits are great for the British scene, with equal prize money for the women and the men – and big thanks to Rapha for sponsoring the women’s race (now there’s an excuse to buy their shirts!). In honour of the Nocturne, it’s time for the UK edition of Shirt Week, and I’ll tell you how you can buy women’s cycling team jerseys for the British peloton. If you know of more teams with their shirts for sale, tell me in the comments – and although I’ve posted them before, follow these links to buy kit for Wiggle Honda, Specialized-lululemon and Vanderkitten. But first, let me tell you a little bit more about the race…. Mark it down in your calendars kids! Today we received our very first photo of one of our Social Media Jersey prize winners with their prize. Sarah’s posted the general prize update here, so I won’t re-hash all that. What we will do is use this post as the place to post new photos as we get them. We may also add comments or quotes from the winners, or possibly make up stories (hint: the made up stories are italicised). 20/11/12 Here’s our overall winner, Emma Trott, wearing her Jersey! 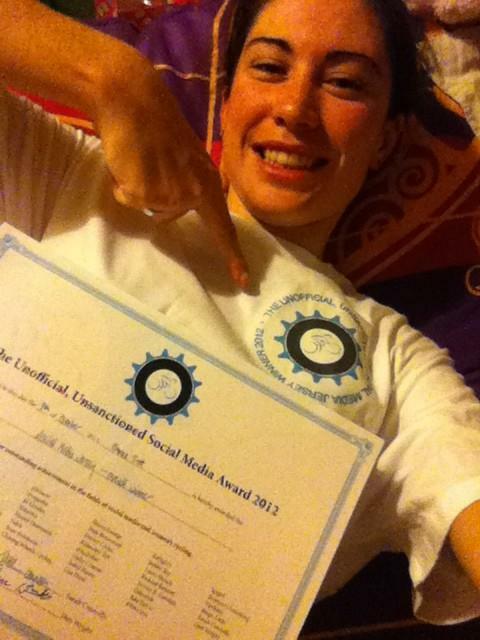 Emma is the winningest winner we’ve ever had when it comes to the Social Media Jersey and we’re proud that she’s added such a prestigious award to her palmares at such an early age. 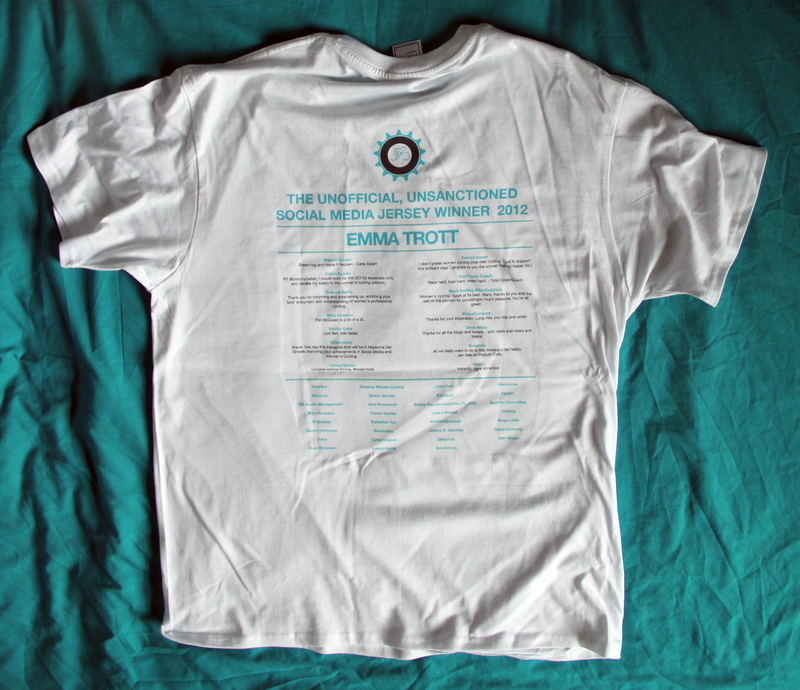 Emma is also the youngest ever winner of the social media jersey, the best looking, the richest, the funniest, the smartest, the toothiest, the hairiest, the smelliest, the sweetest, the kindest, the most articulate, the Britishest, the fastest and the fury-est. Good job Emma! It’s very exciting! 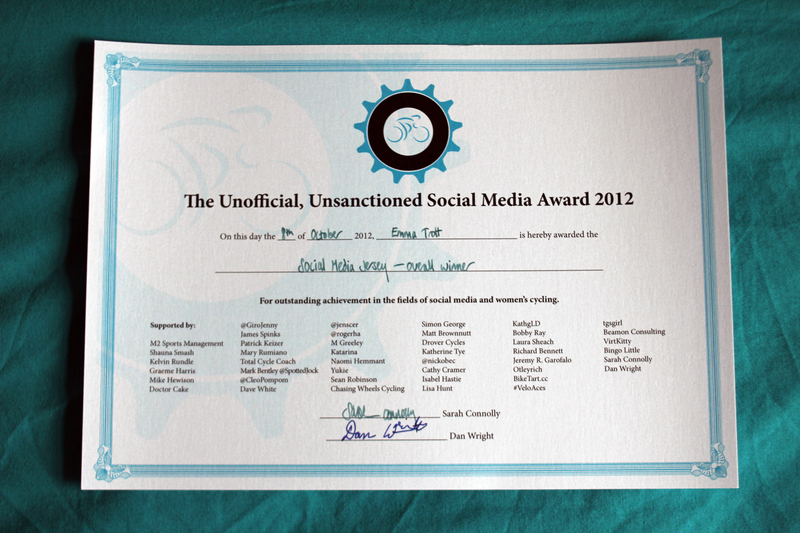 We’ve sent out 10 of our 11 real cash prizes for the Unofficial Unsanctioned Social Media Jersey, most of the certificates out, and are only waiting for a few more details before we’ve sent everything out – and once again, we have all of you to thank. and our fabulous overall Jersey prize winner, Emma Trott, gets a Jersey, too. This is in the post right now! Isn’t that great? THANK YOU TO EVERYONE FOR MAKING THIS HAPPEN!!! We’ve asked the winners if they can take photos of themselves with the fabulous prizes, and anything we get, we’ll post here, so you can see them in real life. 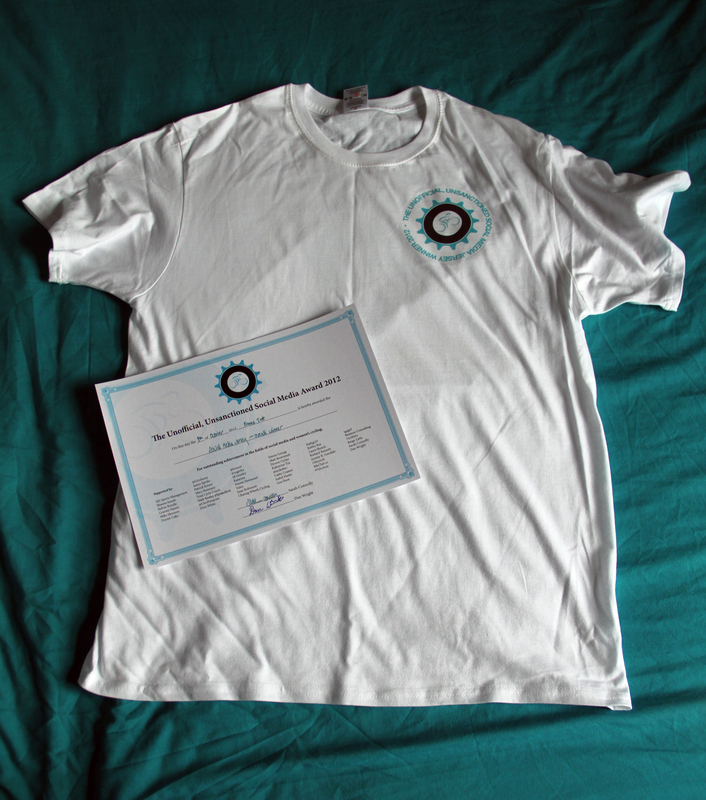 And if you want to remind yourself who won what, check out the prize post – and here’s the post that started it all… More to come very soon! Or you can see if the iOS6 update has ruined your iTunes podcast experience by clicking here.